This oil has a beautiful, fresh, green herb taste. Basil and olive oil are two important ingredients in Mediterranean cooking and it was just obvious the fusion would be wonderful! 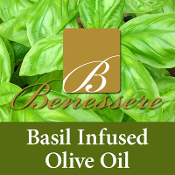 Try it on a salad paired with a berry balsamic vinegar, drizzled on pizza or anywhere you love basil.